Light Sail VR used the 8ball, seen here with the Odyssey, on a project exploring racial identity with Google. We’ve been excited about Hear360’s 8ball spatial microphoneThis is a description of a microphone it goes here and it's long so that we see if it gets cut off. since hearing samples from it at NAB 2017 last spring. On Feb. 15, 2018, after more than two years of beta testing, the 8ball and its software suite officially became available for purchase online for $2,500. The omni-binaural microphoneThis is a description of a microphone it goes here and it's long so that we see if it gets cut off. 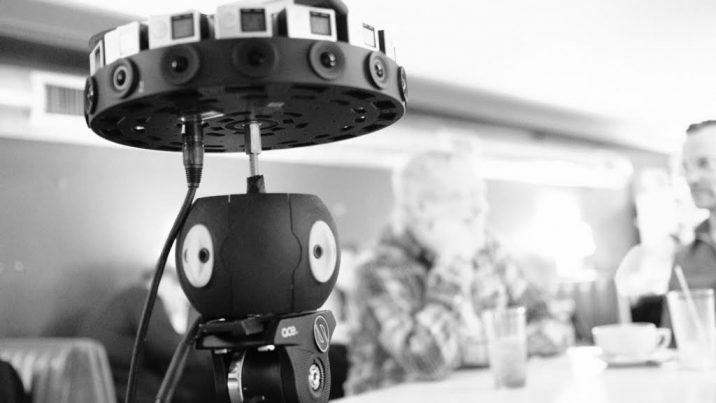 captures 360 degrees of audio with four pairs of omnidirectional capsules that can be integrated into VR productions using a suite of plugins available to 8ball customers. Its companion software includes tools to align spatial audio and spatializeMix in post-production to distribute sounds into positions in a sphere around the listener. audio from other sources, among others features, and enables delivery to Samsung Gear VR, Unity, Oculus, Vive, Facebook and Youtube. Matt Celia from Light Sail VR has been using 8ball on his VR productions for almost two years now as one of the 8ball’s beta testers. Here, Matt shares his experiences with the mic and its workflow. How long and on how many projects have you used the 8ball? We’ve been using the 8ball since we first worked with Greg from Hear360 as the sound engineer on a piece we did with Reggie Jackson called “Reggie’s Garage” in April 2016. I was incredibly impressed. Since then, every project we’ve done at Light Sail VR has had immersive sound. Some projects use the 8ball more than others, such as the live action horror Opera we created with Opera on Tap and the pilot for our music series #ConcertForOne. Both those projects used the spatial microphoneThis is a description of a microphone it goes here and it's long so that we see if it gets cut off. as the only recording source to maintain a sense of true authenticity of the scene. What made you decide to start using the 8ball? What had you been using before? We started using it because we knew we wanted to bring spatial audio to our work and we were really impressed with the early demos and design. I think the quality is fantastic. Before 8ball, our workflow was strictly in a stereo audio world. How does the 8ball compare to some of the other spatial audio options out there? I had listened to a lot of spatialized audio before hearing the 8ball. What struck me was the authenticity of the sound that comes straight out of the microphoneThis is a description of a microphone it goes here and it's long so that we see if it gets cut off.. No weird decoding, no processing. It just sounds exactly like I hear. The spatial feels organic and precise. 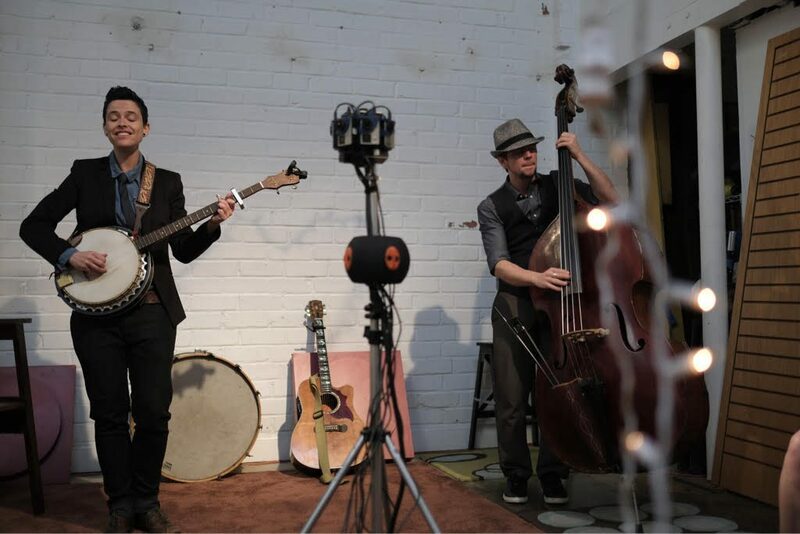 Light Sail VR used the 8ball for its #ConcertForOne with LA-based folk/bluegrass band Abby & The Myth. Four channel ambisonicPertaining to audio reproduction that captures the spatial acoustic qualities of recorded sound. microphones at the time weren’t doing that for me, and 3DIO had a microphoneThis is a description of a microphone it goes here and it's long so that we see if it gets cut off. (made popular by Chris Milk in the piece he did with Beck) but I couldn’t figure out where you would mount it. Plus it was about 3x more than I wanted to spend. The design of 8ball was really smart. The quick release plateA part of a composite, usually intended as a background, though here it refers to a duplicate version of the main shot w... More, the integration with Zoom. It added up to great sound quality at a price that fit. Speaking of design…how have you been mounting the 8ball to your camera? We mount the 8ball just below the camera on our monopod. This works amazingly well as it maintains the spatial awareness and keeps our profile slim. Since we remove the tripod anyway, it’s easy to patch out. What accessories do you recommend having alongside it? I definitely recommend the Zoom F8 recorder, as well as a wind sock. Beyond the 8ball, what other mics are you typically using? We often use Lav microphones to capture the talent. In that case, we use the 8ball to record ambient room toneAn extended clip of sound recorded in the scene location without any additional sounds included. and BG’s for use later in post production. So, you’ve captured the spatial audio with the 8ball. How does it integrate into your post workflow? One of the major strengths of the 8ball is that post production sound isn’t as intensive as it is with other spatial microphones. If you wanted, you could actually link the four pairs of stereo audio and upload natively to SamsungVR’s binaural format and have it sound great. This is why for recording live music or natural sounds it works so well. When we do use it in a post production sound environment (which, being a narrative VR studio, we do a lot), we send the lav tracks over with the 8ball 8 channel audio files to our audio mixer. They will mix the lav tracks in space using the Facebook Spatial workstation and then either use a pair of the binaural microphones as BG sounds in the scene, or convert it all to AmbiXA method of storing ambisonic audio data in the SN3D format.. The AmbiXA method of storing ambisonic audio data in the SN3D format. conversion loses some of the data that you get with Omni binaural capture, but it works when using it in conjunction with the Facebook Spatial Workstation. 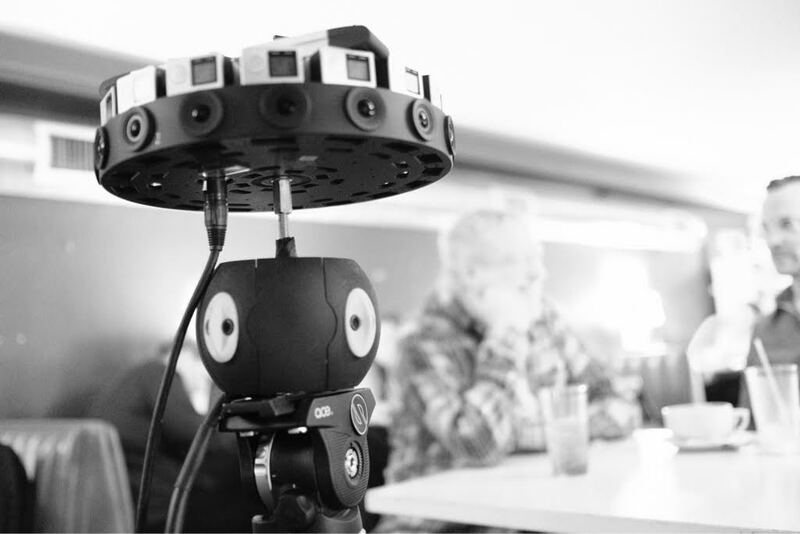 We’re excited on our next project to try the native Hear360 tools that have recently come out into beta. Do you use the 8ball for every shot? 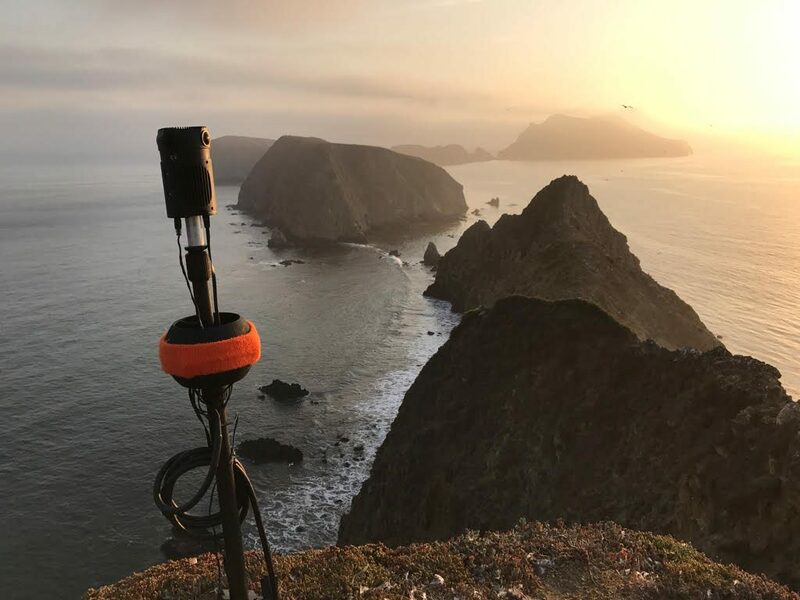 Here, Light Sail VR uses its 8ball mic on a shoot for the National Park Service, shooting a tour of the Channel Islands. We almost always record with the 8ball so that we have a really solid reference audio for spatial sound. If we’re doing a show that’s going to be a lot of post sound design, then we might not use it as much and we’ll rely on Lav microphones. But if we are recording music or a “now” moment as I like to call it, the 8ball offers the absolute best sonic quality, putting you right in the middle of the action. I think that if your environment sounds really great, the 8ball works amazing. I think if you want your environment to sound different because say, the room has a lot of weird reflections and A/C hum, then you’re probably going to want to stick to Lav mics and build your BG in post. What kind of support system does Hear360 have established for 8ball users? Matt and and Greg have been very supportive of our indie VR studio, often consulting when we had spatial audio questions and also helping us figure out the post workflow of the microphoneThis is a description of a microphone it goes here and it's long so that we see if it gets cut off.. It’s a small but very dedicated team. This product has been in beta testing for over two years and they’ve made so many improvements to the product in that time, it’s kind of amazing. We’ve seen their documentation grow from non-existent to being very detailed. A direct response from both of them has been my experience so far. I don’t know how long this will go on as their company scales, but I will say that they are personally very invested in their product and have the interests of creators in mind when they say that they want VR to simply sound better. The 8ball is currently available for $2,500 from Hear360’s website.